Capybara (Hydrochoerus hydrochaeris), belonging to the Hydrochoerus genus is the the largest semi-aquatic rodent in the world. The only other member of this genus is the Lesser Capybara. Both the terms in its scientific name are derived from the Greek words ‘hydor’ meaning water and ‘choiros’ meaning a hog or pig. The members of this genus are believed to have been larger than a bear during the prehistoric era. Mostly found in South America, it is a close relative of the guinea pig and rock cavies. Shape: Capybaras have a heavy, barrel-shaped body along with a large rectangular-shaped head. Size: The adults are generally 100 cm to 130 cm long and 50 cm to 60 cm tall. Weight: An adult capybara weighs between 30 kg and 70 kg on an average with females being a little heavier than their male counterparts. Color: The upper region of their body is marked by reddish-brown fur whereas the lower part has a yellowish-brown tinge. 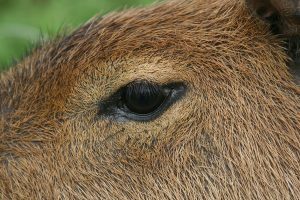 Eyes: They have tiny black eyes on the upper side of their head. Ears: Their small, black round shaped ears are located just above the eyes. Legs: Characterized with short legs and partially webbed feet, their forelimbs are slightly shorter than their hindlimbs. On their front and rear feet they have four and three toes respectively. Teeth: They have long and sharp teeth. 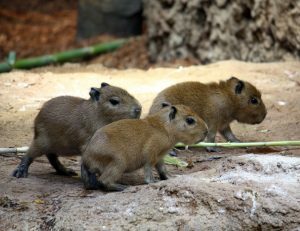 Muzzle: These semi-aquatic rodents have a short, blunt muzzle. Tail: They have characteristic vestigial tails. 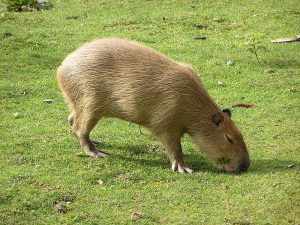 The rodent is found in Brazil, northeastern part of Argentina, Colombia, French Guiana, Paraguay, Peru, Venezuela (marshy regions of Los Llanos) and most other South American countries except Chile. They prefer to live in dense forest areas located near swamps, ponds, lakes, marshes as well as flooded savannah grasslands. These sociable animals mainly live in groups of 10 or 20 or sometimes even in a smaller group where only members of family are present. During the drier season larger groups of about 50 or 100 capybaras are seen. Male capybaras, being territorial in nature, mark their area with a liquid secreted through their morillo gland. The heaviest male is known to dominate the pack. The leader, on being challenged by another male of the group, is obliged to enter a fight that continues until one of them escapes the place. The dominant male has the benefit of using the safest shelters to escape from predators as well as of mating with females of the group. Though they are mostly active during early mornings or dusk, they become nocturnal in areas with human habitation. Not sleeping much, they doze in the morning, relaxing on the banks or stretching along the muddy wallows during hot afternoons. They may bite each other to display their playful as well as aggressive mood. 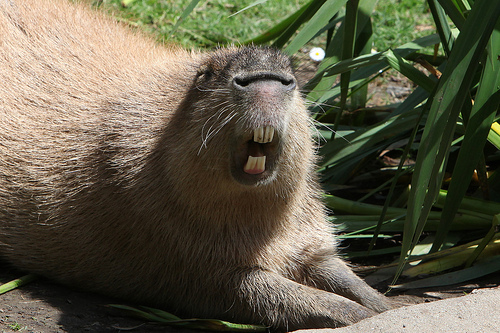 Capybaras emit different sounds to express their changing moods. A feeling of satisfaction is expressed by a low pitched clicking sound, whereas a grunt or purr reveals their submissive mood. The males chatter their tooth angrily to reveal their aggressive mood. On sensing danger, the subordinate male members give out a bark just like a dog to warn the clan, causing all members to rush to the nearest water body, keeping the young ones at the center. Being herbivores, they mainly eat aquatic plants, grasses, reeds, tree bark, grains, corn, green leaves (mainly manioc) as well as fruits like squash, bananas and melon. The plants consumed by them in summer are not eaten during winter due to a reduced nutritional value. They are categorized as coprophagous as they feed on their own feces. The mammals also show regurgitating behavior like cows. Majorly preyed upon by anaconda, its other predators include ocelot, eagle, puma, caiman and jaguar. The young ones are mostly attacked by vultures, foxes, piranhas and feral dogs. Being great swimmers and divers, they can easily avoid being preyed on by quickly moving to nearest water bodies. The eyes, ears and nose located on top of their head allows them to see, hear and breath while the the rest of the body remains under water, allowing them to escape predators. Eating their own droppings help them in digesting the cellulose content of grasses as well as extracting high amount of protein and vitamin from their food. The presence of a large pouch called cecum in their intestine helps in churning and storing fibrous matters as well as mixing the enzymes, bacteria and gases to facilitate smooth digestion. During the mating season, females attract males by secreting a scent as well as whistling through their nose. Capybaras mainly mate in water, with the females either remaining submerged or moving way from water on not wishing to mate with a particular male. Though occurring throughout the year, the favorable mating season is between April and May. 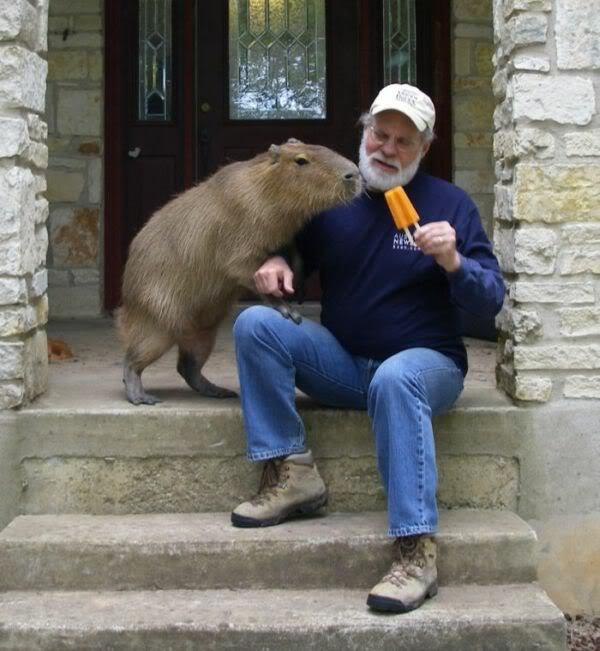 The sperm of capybaras have a longer span compared to that of other rodents. Having a gestation period between 130 and 150 days, the female produces a litter of one to eight babies with the average number ranging around four. 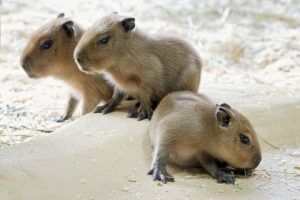 Weighing about 1 kg to 1.5 kg at birth, the baby capybara, often called a pup, is born with hair and eyesight. All female members of the group help the mother to look after the babies. After a week of birth they can feed on grass, though they are not weaned until 16 weeks of age. 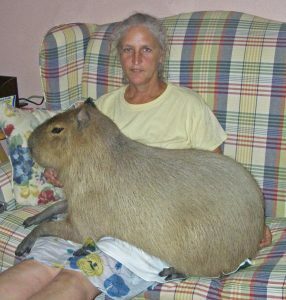 A baby capybara, not being a good swimmer mostly lives on land. Some of them are also seen riding on the back of the females as the latter swim. They attain puberty as well as sexual maturity at about 15 months, after which they can live on their own. Having a life span of 7 to 10 years in the wild, they live for about 12 years when kept in zoos or bred in captivity. A big water body, about 3.5 meter in depth should be provided as they are semi-aquatic and love to swim and remain submerged in water for certain parts of the day. Being swift and agile, they run as fast as a horse, being able to conveniently squeeze themselves through small outlets. Therefore, proper fencing in necessary to prevent them from escaping. These large animals need sufficient space to move about freely. Make sure that the enclosure has a sunny place where they may bask, as well as a shaded region to help them protect themselves from heat. A heat lamp may also be placed in their dwelling areas during colder times to keep them warm. As they thrive mostly on grass, a big lawn or grassy field suits their purpose well. They should also be provided with fresh fruits, vegetables, hay and cattle pellets. Giving them a lot of branches and sticks to chew on helps them in wearing their teeth, preventing dental problems. The species is categorized as “Least Concern” by the IUCN. 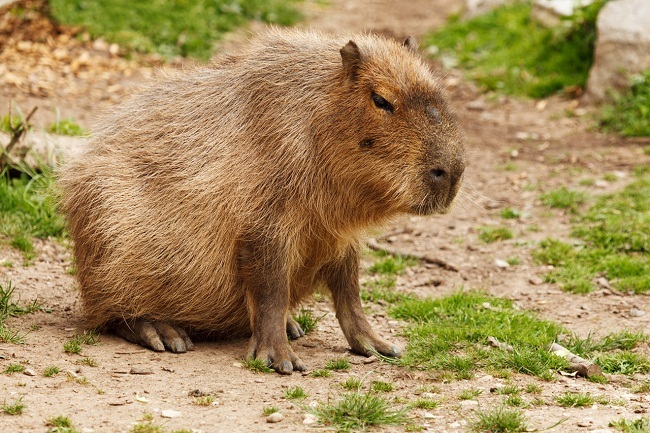 The heaviest of these mammals have been found in Brazil and Uruguay, weighing 91 kg and 73.5 kg respectively. 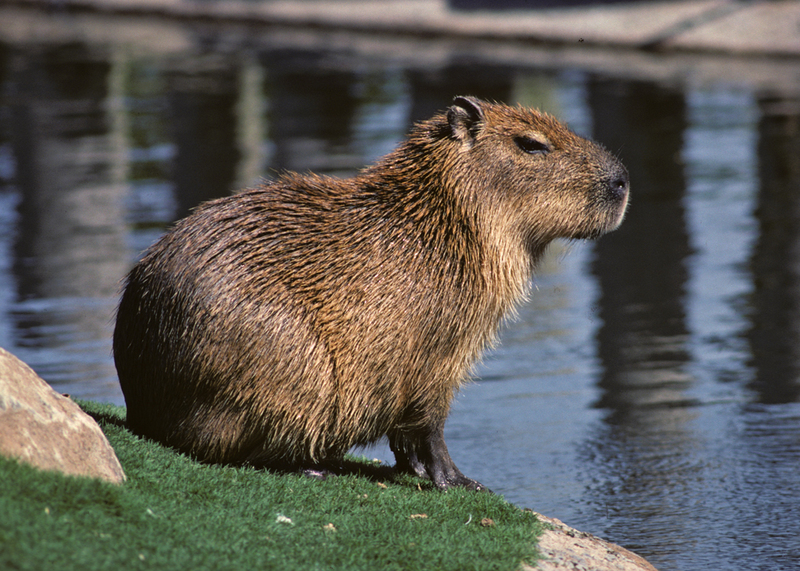 In Spanish, it is called carpincho, whereas the Portuguese call it capivara. 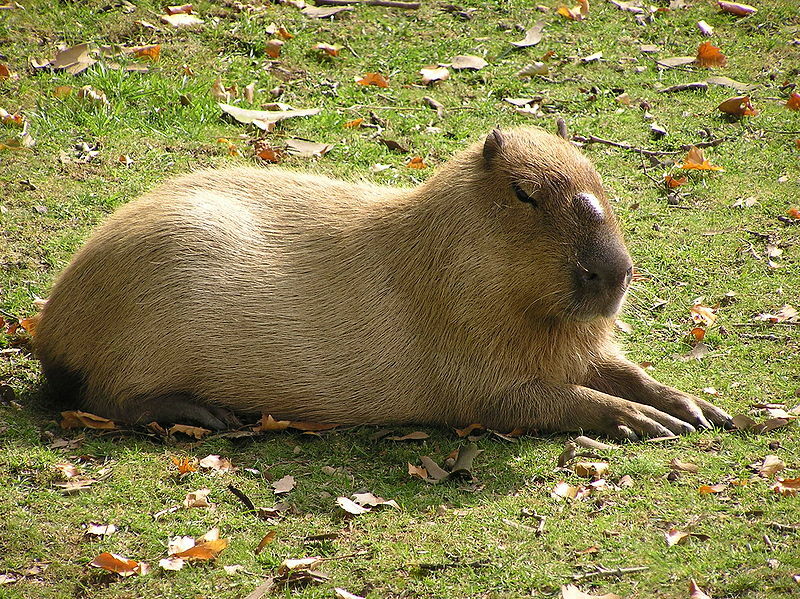 In the 1700s, capybara was declared to be a fish by the Vatican and thereby eaten during Lent. 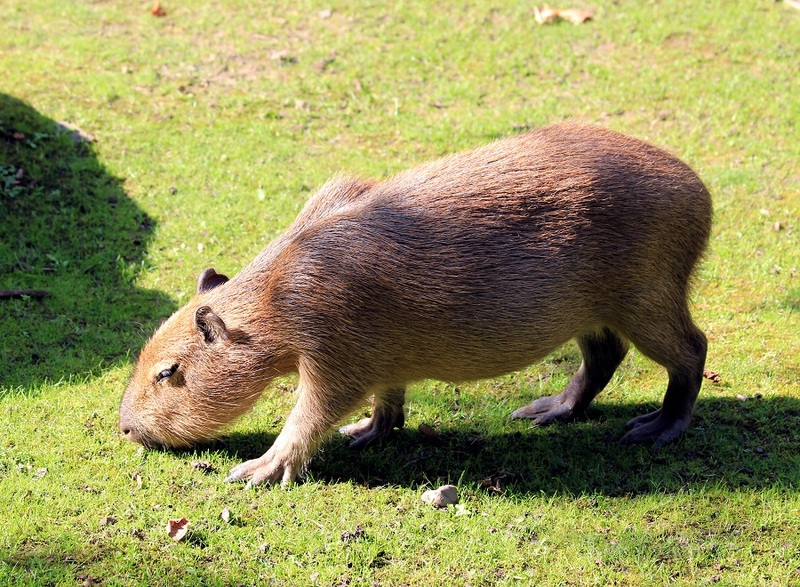 In the Brazilian language of Tupi, capybara means “one who eats slender leaves”. In South America, they are killed for their meat and hide. Though they travel to far off places in search of food, they return to the same spot at the end of the day. Their daily food comprises of about 3 kg of grass. Having sharp teeth, they are capable of inflicting painful bites if provoked. They have characteristic star-shaped footprints.